Coming next month to Anthropologie, a new exclusive limited edition collection from niche perfume line Ineke. The new Floral Curiosities collection follows last year's Anthropologie collaboration with Le Labo. A mutual passion for art, design, travel and literature brought Anthropologie and Ineke together to create Floral Curiosities. Available only at Anthropologie stores, the collection, also inspired by Ineke’s garden, captures the essence of rare botanicals. Four flowers with distinct personalities are represented in the collection. Each flower’s unique character is expressed through the artistically rendered packaging which will make the Anthropologie customer eager to showcase them on her vanity. 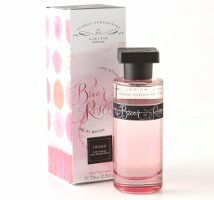 Briar Rose (shown) ~ "Fruity and Powdery. Dark accents inspired by twisted thorns characterize Briar Rose. Black raspberry, bitter almond, exotic spices, black violet, patchouli and cacao absolute come together to form a unique fragrance." Angel’s Trumpet ~ "Rich and Opulent. Angel’s Trumpet opens with refreshing notes of honeydew melon, Seville orange and leafy greens. The fragrance is then warmed by cinnamon leaf and allspice and supported by Virginia cedar and white musk." Poet’s Jasmine ~ "Citrus and Herbal. A fragrance inspired by Poet’s Jasmine tea, replete with slices of citrus fruit. Added points of interest include star anise, rosemary, absinthe, frankincense, cardamom, hinoki wood and guaiac wood." Scarlet Larkspur ~ "Floral Oriental. The scent deepens with notes of claret wine, nutmeg, saffron, amyris wood, tonka bean and bourbon vanilla after a bright fruity opening consisting of blood orange, red currant and morello cherry." The Ineke + Anthropologie Floral Curiosities fragrances will be available in 75 ml Eau de Parfum, $68. Update: see a review of Poet's Jasmine. I love perfume, and I love Anthropologie, but so far I’ve been underwhelmed by the latter’s foray into niche fragrance. When I last visited Anthropologie they didn’t even have smelling strips available; eventually an SA brought out a pad of scratch paper for this purpose. Also, although the Histoires and Strange Invisible lines are available on the website, they’re not in stores. I had the same thing happen to me. About a total of fifty or sixty testers grouped at different locations around the store and not a test strip in sight. Asked the SA who had to search several drawers behind the counter and to find a pad of them, from which she proudly tore off and handed me a *single* test strip. Ultimately convinced her to surrender two more. Apparently they must be extremely valuable and I was very lucky to get these three! I have a feeling maybe they are emphasizing internet over in person sales? Or maybe they’re working more on some stores than others. My store has a very limited selection. I’m not wowed by any of Anthropologie’s fragrance offerings, but I never use scent strips anyway. I use the tester to spray the top of the packaged bottle and sniff either the cardboard of cellophane. I went to the closest Anthropologie to me just to look at the fragrances and I don’t remember finding any scent strips either. To be honest they barely had any fragrances in the store so it hardly mattered. I would guess there were less than a dozen fragrances when I was there. Very disappointing. These sound nice but I won’t make a special trip to go sniff them because I doubt they would be there to sniff. I thought the Le Labo ones were terrific, and bought 2 of them! I was surprised by the price of these, but I see they’re about the same as the Le Labos. That’s the one I want too! Ive only bought scented candles from Anthropologie so far, but i recall liking 1 or 2 fragrances from the collabo they did with D.S. & Durga. None of these appeal to me, but maybe as a gift. I’ve come to think of Anthropologie as instructive for understanding the importance of *structure to successful fragrance. IMO Anth carries a lot of fragrances with appealing notes and absolutely no scaffolding to make them have space or dimension — they seem like they’re lacking the chemistry (literally) to pull off otherwise successful ideas. So if someone wanted to understand structure as an evaluative criteria in perfume, I’d send them there. By the time of the movie, the scent was completely gone. Maybe this was a result of what you call a lack of scaffolding. However, I have one FB of Ineke’s Field Notes from Paris as well as her sampler set. They are long lasting; Every single one is well made. Her website prices for her own line are about as reasonable as the Anthropologie price, so these might be a real well made treat. I’m totally taking what you’re saying about Ineke into consideration, I do see her sample set on Anthropologie’s website! Probably a dumb question, but could you explain what you mean by structure? The way the bottles are displayed, or something about the way the notes emerge in the scent? I’m interested in these because I think Ineke does some good stuff. I agree with the above posters, though, that Anthro does not seem prepared for customers who want to actually test fragrances. The one I go to from time to time rarely has tester bottles, let alone scent strips. The Honoré des Prés line is nice, too, although short-lived. Which I actually appreciate at times. A friend *cough* tells me she sometimes swings by Sephora and swipes a few of their scent strips before heading over to Anthropologie. I don’t think you’ll ever find anything soul stirring there but now that Blue Mercury has closed in my local mall, Anthropologie is the closest I can get to niche without ordering on-line. It doesn’t hurt that they’re reasonably priced either. I’m not spending $300 unless it makes the angels sing and sometimes you just want something new to wear without having to take out a second mortgage. I haven’t had a chance to try this line yet – I think there’s only one place in the UK that sells them. These have me intrigued though, so I’ll need to start hunting down some samples. True..Liberty it is. But they’re not so reasonably priced. Inekes retail for $88 in the US but £80 in Liberty! But this line, the same 75ml bottles sell for $20 less than the proper Inekes…Great value and no reason not to try them! Particularly interested in Angel’s Trumpet and Poet’s Jasmine! Poet’s Jasmine does sound lovely. Anthropologie is a lovely store, but it’s hard to actually shop in – things are scattered artistically all over,making it hard to compare similar items. And the tester issue is an issue, at least in the store nearest me (which isn’t that near, actually). I’ve gone in a number of times, but never actually bought anything -does that say something? I admire Ineke’s fragrances and own three: Gilded Lily, Evening Edged in Gold and After My Own Heart. All three are, at a minimum, absolutely lovely. I will definitely make some test strips and try the Anthropologie offerings. I agree that Poet’s Jasmine sounds terrific as does Scarlet Larkspur (if I can make it through the topnotes…). I’m so glad these have finally been announced! I heard about them in the spring when we had our Sniff and Ineke did her presentation. I had a bit of a gag order out on me so I didn’t overly blab. Anyway, I’ve been waiting for them ever since!